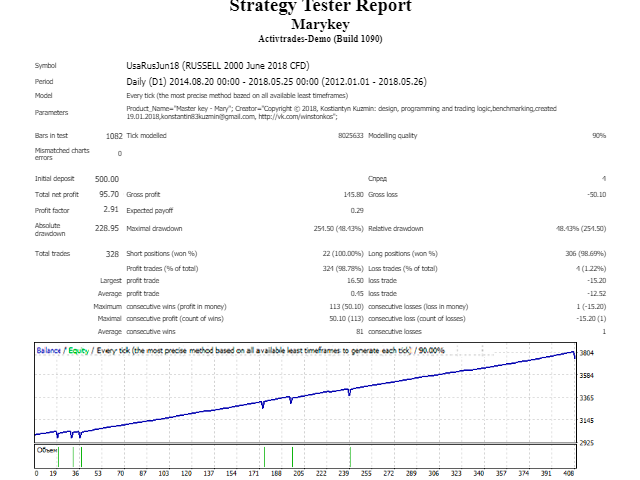 ATTENTION IT IS IMPORTANT: Do not use this system for trading in currency pairs. ATTENTION IT IS IMPORTANT: Do not use this system for trading and testing without individual set files for the selected broker. 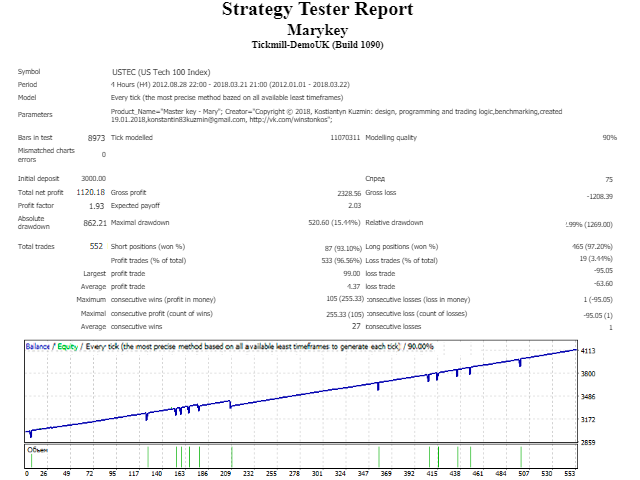 Marrykey stock Indexes is a scalper system built on the hybrid combinatory Ichimoku Kinko Hyo is equipped with 6 different strategies and designed primarily to work on US stock indices such as S & P500, NASDAQ, Dow Jones, Russell2000. The system is capable of operating on frames from M5 to W1 and has a flexible setting. 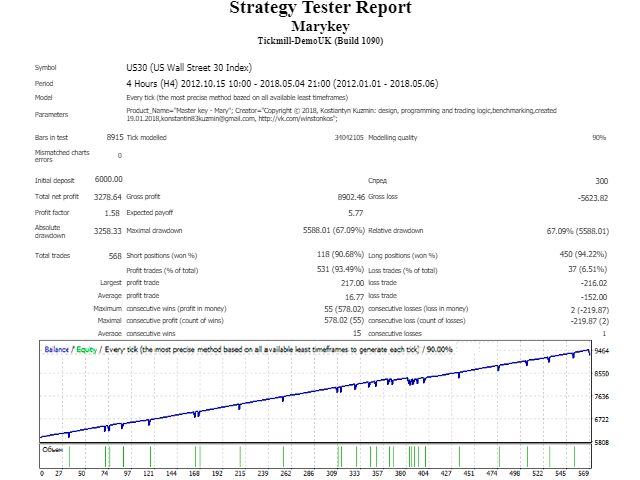 The system can be installed on any time frame, by default we use D1. Marrykey stock Indexes - has the function of compensating loss trades by increasing the lot of specially selected orders from separate time frames, this function is based on the mathematical statistics of the system. 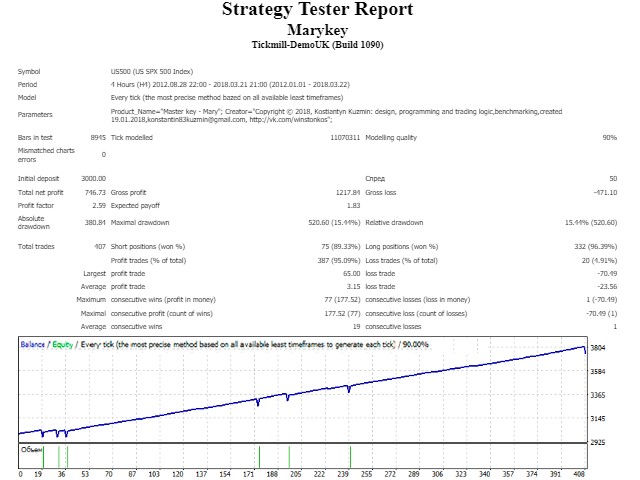 Marrykey stock Indexes - is equipped with automatic risk management. Management of the system's stability is made using two parameters (transaction risk and stop loss), increase the stop loss and reduce the risk for the transaction if you want to add stability to the system. You can also trade futures indexes on which there are no swaps for this, you need to enable the futures trading option so that you can use the hedging system more efficiently. Attention is important: every broker requires an appropriate configuration. Works with leverage 1:10, 1:20, 1:30 and above. The system has copyright protection against slippage of orders. It can also be configured for European indices. All description and Set files will be posted in the discussions. Test and use the system only with Set files.